Sunrise Farms Sport Horses, Inc.
Shelley Van den Neste has a long list of accomplishments to her name, including being a USDF Bronze and Silver Medalist. 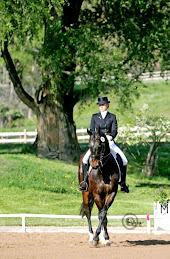 In addition to being a gifted dressage teacher, she has coached and trained many regional championship riders in hunt-seat equitation, western pleasure, saddle seat equitation and pleasure. Shelley trains regularly with Walter Zettl, who frequents her training facility to coach. It was such a high to be showing three wonderful horses at this horse park that I was proud to be a part of for the first 3 years. When I started the job as Equestrian Facility Manager at Jim Brandon, the horse park was just 800 plus acres of dirt. The facility was not named yet, and the County comissioners had very little faith that the Park would ever be used except by the local horse club. 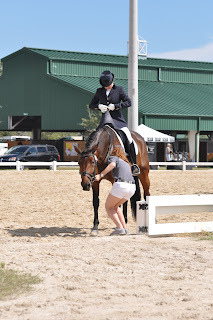 So to be showing at the Championshps at Jim Brandon was extra special for me. Here is my daughter Alexia putting the final touches on Ezmarelde la Biladora before her first level championship test. It takes a team to make a champion and I couldn't have done this show without Lexi, Christine, Jill, Mom, and my husband Karel there supporting me and the wonderful horses Ezmarelde, Latin Lover V and Susquehanna.